Gambit is a 1966 American comedy heist film starring Shirley MacLaine and Michael Caine as two criminals involved in an elaborate plot centered on a priceless antiquity owned by millionaire Mr. Shahbandar, played by Herbert Lom. It was nominated for three Academy Awards. The film was advertised with the tagline, "Go Ahead: Tell the End (It's Too Hilarious to Keep Secret) But Please Don't Tell the Beginning!" Gambit was directed by Ronald Neame from a screenplay by Jack Davies and Alvin Sargent from the original story of Sidney Carroll. A remake, with only basic ideas in common, was released in 2012, with a script by Joel and Ethan Coen. 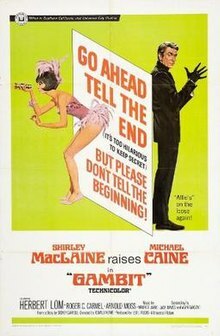 Cockney cat burglar Harry Dean (Michael Caine) and his artist friend Emile Fournier (John Abbott) discover exotic Eurasian showgirl Nicole Chang (Shirley MacLaine) in a crowded Hong Kong restaurant. She bears an incredible resemblance both to the late wife of the world's richest man, an Arab named Shahbandar (Herbert Lom), as well as to a priceless ancient Chinese statuette that he owns; Harry and Emile want to use her in a scheme to rob him of it. The caper—in which Nicole never even speaks—seems to play out flawlessly before it is revealed that this was merely Harry's explanation of his plot to Emile, and the story returns to the beginning. However, nothing in the actual caper works out as smoothly as Harry had planned. Harry approaches Nicole, who initially resists his offer, until he offers her a legal British passport and $US5,000. Harry and Nicole arrive in the Middle Eastern city of Dammuz under the assumed identities of Sir Harold and Lady Dean, and check into the hotel where Shahbandar, its owner, lives in the penthouse. Shahbandar is suspicious of the couple from the outset, and partly because the real Nicole is more unpredictable than in Harry's imagined scenario where she meekly obeyed instructions. She is aghast when she learns what Harry wants to steal, but goes along because she is falling in love with him. Shahbandar plays along with Harry and Nicole to see what they are plotting, and when they ask to see his home and the statuette, he takes them to it. Harry then declines Shahbandar's invitation to dinner, but persuades Nicole to accept. While Nicole occupies Shahbandar's attention at dinner, Harry sneaks back into the penthouse to steal the statuette. Nicole realizes that Shahbandar suspects them, and slips away to warn Harry. Working together, they steal the statuette, but accidentally trigger the alarm. At Harry's insistence, Nicole flees to the airport to return separately to Hong Kong, while he hides from the guards. Harry watches as the guards discover that the statuette is gone, but they immediately check a secret compartment in the wall of the room, where the real statuette is hidden: the one in Harry's hands is a copy. Harry replaces the original with the fake and leaves. Shahbandar then rechecks the secret compartment, finds the fake, and has Nicole arrested at the airport. Some time later he tells her that his agents have found Harry in Hong Kong: he too will be arrested unless the real statuette is returned. She is free to go if she takes that message to Harry. Harry and Nicole meet at Emile's workshop in Hong Kong. Harry reveals that he never actually took the statuette out of Shahbandar's apartment, but hid it inside a statue Emile had sold him, and told Shahbandar this while she was traveling. Harry never intended to steal the statuette, but only to give the appearance that it had been stolen—so that Emile could now sell off another replica as the real thing. Emile had made the one that Shahbandar had on display, but had secretly made an extra one. They have three prospective buyers already. Nicole wants to breaks up with Harry, unhappy at his criminal lifestyle, but Harry smashes the replica to prove she is more important to him than his life of crime. She and Harry leave together as Emile looks disconsolate at the end of the scheme. But then he receives a telephone call and starts making arrangements with a buyer. He opens a locked cupboard—containing three more replicas of the statuette. In 2012, a new Gambit was released. This version co-starred Colin Firth and Cameron Diaz in the leads, with Diaz's character now a Texas rodeo performer who is coaxed by Firth into coming to England and attempting to con a billionaire played by Alan Rickman. The script for this adaptation was written by Joel and Ethan Coen. ^ "The 39th Academy Awards (1967) Nominees and Winners". oscars.org. Retrieved 2011-08-24. ^ "NY Times: Gambit". NY Times. Retrieved 2008-12-27. This page was last edited on 14 April 2019, at 21:03 (UTC).